Family law is an area of the law that generally deals with family-related and domestic issues such as marriage, civil unions, divorce, spousal abuse, property, spousal support, child custody and visitation, child support, as well as child abuse issues, and adoption. Today, separation and/or divorce is a more complicated process than ever before. Because the law is so complex and ever changing, it is important to seek legal advice immediately when any questions about separation, divorce or child access issues arise. Keep in mind that laws differ dramatically by state. Maryland has a specific set of statutes that govern the process for separation and divorce. Navigating these waters on your own can be costly, and we're not only talking about money. We take great care in assisting our clients in returning to a sense of normalcy as quickly as possible and in a manner that takes the importance of quality of life into account and one�s desire to move forward in a productive and positive fashion. While money is important, wouldn�t you agree that peace of mind is often priceless? We can help. Family law issues are highly emotional and often we see otherwise good people at their very worst. Mike Mastracci has personally lived through such times and really knows how you feel. Being a superior Family law lawyer is about far more than providing good legal advice; practical experience and knowledge of suitable resources can go along way in helping you during these difficult times. Especially when children are involved, it's imperative that you know your rights and the rights of your spouse. During our initial consultation Family Law attorney, Mike Mastracci, will walk through the process with you so you'll know what to expect moving forward. You should never make any life-changing decisions before first consulting and securing a lawyer. According to the National Coalition Against Domestic Violence, it has been reported that every 15 seconds a woman is beaten in a domestic dispute somewhere in the United States. Domestic violence, abuse, assault and battery are all crimes that should not be treated lightly. If you are being battered by your spouse or partner, you can seek legal protection, even prosecution, whether you are married to your abuser or not. We can assist you in preserving your safety and your dignity. 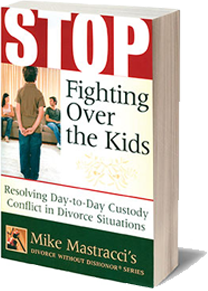 Custody and visitation litigation should generally be an absolute last resort. People are often disappointed when reality sets in and they realize that it will never be "over" as long as both the parents are alive. Additionally, many studies have shown that often parents that do not get along well before custody litigation actually get along even worse after the initial judicial decision. Matters often escalate because of the win-lose settings that litigation creates and fosters. Here at the Law Offices of Michael Mastracci, we work with you and your partner to first attempt to settle all matters out of court, to come to an amiable agreement that both side can live with and that is in the best interest of your children. When out of court settlements are unattainable, we fight to win, but with your children�s best interest being of paramount concern.